Annual Board of Directors Meeting held Monday January 24, 2005 at the Schnitzelbank Restaurant. Annual Membership Meeting took place during the monthly German Club Meeting March 17, at the VFW. All Directors and Members of the Board were elected as nominated by the Board. Mayor William Schmitt invited the two teachers from our JHS exchange school in Poessneck, Germany for dinner at the Schnitzelbank on April 5, at 6pm. Mayor Schmitt, Anke Weniger and Karola Festag were joined by host Robert Fleck, Principal Jerald Roberts, Superintendent Larry Riggs, JHS German teacher Julie Newton, Stan Jochum, Matthias Hilger and Jim Gutgsell. Jim Gutgsell visited Pfaffenweiler in May and took the opportunity to discuss more details about the 20th anniversary celebrations in August. The visit by the St. Joseph Church Choir in June to Pfaffenweiler was truly a success. They arrived in Pfaffenweiler on June 20 and departed June 23 for an extended trip through Switzerland and Austria. Quite a few members expressed a series desire to go back and visit our Sister City again, but for an extended time. JHS German Exchange Students visited Pfaffenweiler/Staufen in June for their four week trip. Eleven students attended with their teacher Julie Newton and her mother as second chaperone. An additional week was spent in the other exchange school Am Weissen Turm in Poessneck, Germany. The visit by members of the community of Pfaffenweiler to celebrate our 20th anniversary was executed with great success in early August. We had extensive media coverage on local radio and TV stations as well as newspapers throughout spring and summer leading up and during the events. The events ended with an invitation by Buergermeister Fritz Gutgsell of Pfaffenweiler inviting the community of Jasper to join them in Pfaffenweiler for the 25th anniversary celebrations in 2010. The excitement about the 20th anniversary celebration in Jasper caused over thirty people to plan ahead and asked to be on the visitor list for the trip in 2010. 3pm Jasper Fire Truck leads bus with visitors into Jasper. promotion of the Jasper/Pfaffenweiler partnership. 9am German Mass St. Joseph Church with Pfaffenweiler and Jasper musicians and choir members. 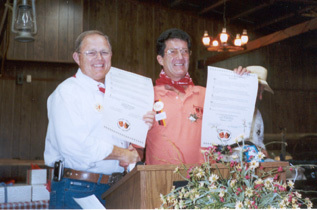 Sister Cities International is celebrating its 50th anniversary in July of 2006. During the celebrations many volunteers making this organization such a huge success over the past 50 years will be honored by being recognized verbally and in the anniversary publication. Sister Cities of Jasper nominated past Jasper City Council at Large Vic Knies and Pfaffenweiler Buergermeister Fritz Gutgsell to the Local Government Leadership Circle. (Two nominations permitted per organization). Dave Buehler, Martina Eckert, Matthias Hilger, Mary Jo Meuser, Ruth Reichmann and Dan Wehr, were nominated to the Circle of Distinguished Volunteers. (Six nominations were permitted per organization). The Herald continues to send the combined weekly editions to Pfaffenweiler. This has been going on for approximately 9 years. The "Pfaffenweiler Column" contributed bi-weekly by Franz and Matthias Hilger continues to have a huge following in The Herald. This is the 9th year for this column. The once a week selection of articles from Dubois County Herald pertaining to Jasper sent per E-Mail to a large list of readers mainly in Pfaffenweiler has been sent weekly until late in the year, when it was discontinued. Sister Cities of Jasper received a grant from Claude and Martina Eckert Sister Cities Endowment of the Dubois County Community Foundation. The annual fundraiser for the JHS Student Exchange Program by Sister Cities of Jasper has been initiated in November and is on target to be successful again. Included in the funds received is a Grant from the Dubois County Community Foundation which increased to $750.